How do I access my scans for eduPrint in Linux? 17. How does the reinstallation of Windows computers work at BMC-IT? 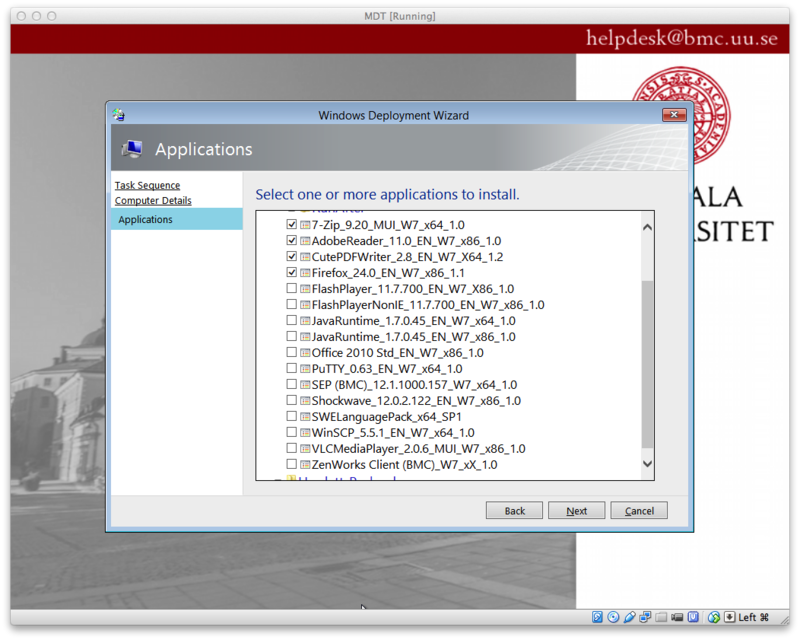 These are instructions for installing Windows 10 x64 Enterprise via MDT 2013. Get access to the installation directory through User-AD group bmc-autoadmin-group. Mail a mail to BMC-IT (helpdesk@bmc.uu.se) with your username and what you want. Get one or several 32 GB USB flash drives. Login on a Windows 10 computer with USB-ports as administrator. IMPORTANT: DO NOT HAVE A NETWORK DRIVE MAPPED TO G: H: I: OR J:! Insert the USB flash drives (max 4 at the same time) in Windows 10 computer. 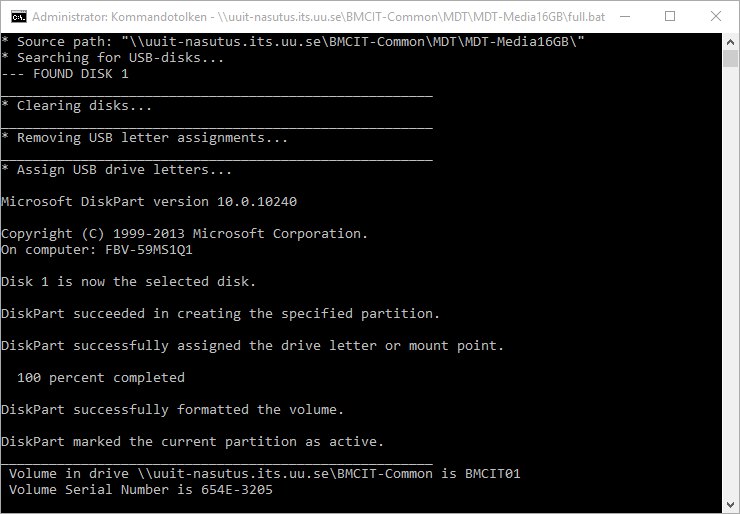 Run command: net use n: \\uuit-nasutus.its.uu.se\BMCIT-Common /user:user\account and login using your university account and password A. This will format and erase all USB flash drives inserted in computer! Wait a long time. The faster the USB flash drives the better. This will not format, just update the sticks with changed files. Pxelinux is coming from syslinux.org. It is included in most Linux-distributions. TFTP is using UDP. The request to the TFTP-server is sent on port 69/udp from any port. The TFTP-server at tftp.its.uu.se (130.238.7.37) is using UDP source ports 6900-6999 for responding. Open up UDP, both directions, from host 130.238.7.37 to your clients. Usually this is all of your subnets. Send a request for this to netsupport@its.uu.se. 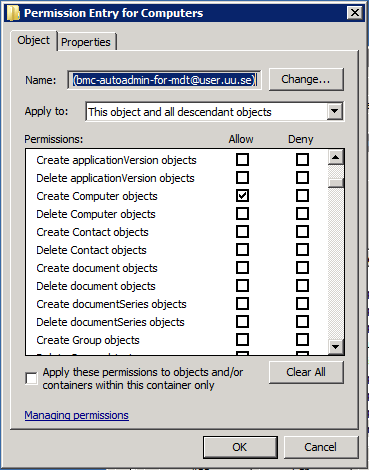 The account USER\bmc-autoadmin-mdt must at least have permission to Create Computer objects in the correct OU to be able to join automatically. 4 GB RAM recommended. It may work with 2 GB RAM but very slow. Support for the PrefetchW-feature in the CPU. Microsoft has for Windows 8.1 dropped support for CPUs without the PrefetchW-feature. This includes the Pentium D 8xx CPUs hich are used in for example many Dell Optiplex GX620 desktops. So even if they have 4 GB RAM they cannot run the installation. Some other Dell Optiplex with the slightly faster Intel Pentium D 9xx are working fine. Make sure you have the latest BIOS for the computer. Press F12 or F10 or whatever to enter BIOS. It depends on the computer model. Press F12 or F10 or whatever it is to be able to select boot source. It depends on the computer model. Choose to boot via USB. Some older computers might be limited to boot from an USB2-port. USB3 might not work on older computers. Press F12 when starting computer to boot via Network. If the Network adapter do not show PXE-booting may have to be enabled in BIOS. 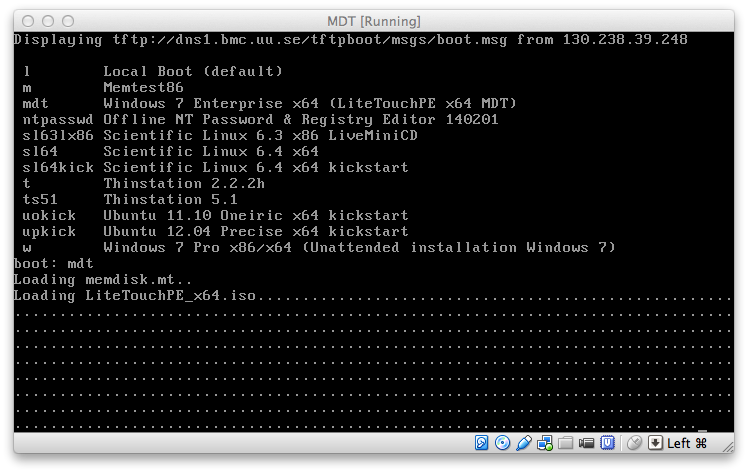 This will boot the netinstallation ISO over TFTP. If it do not work, boot via USB flash drive instead. Continue with installing (next section below). If the installation stops because of a previous installation attempt or if something else is weird with the partition table, previously created partitions may be cleared manually. W10E is the normal Win10 Enterprise x64 deploy. Fill in computer name. The new computer name standard is first three letters for institution, then a dash and the computer serial number. The serial number is automatically read from the computer BIOS. 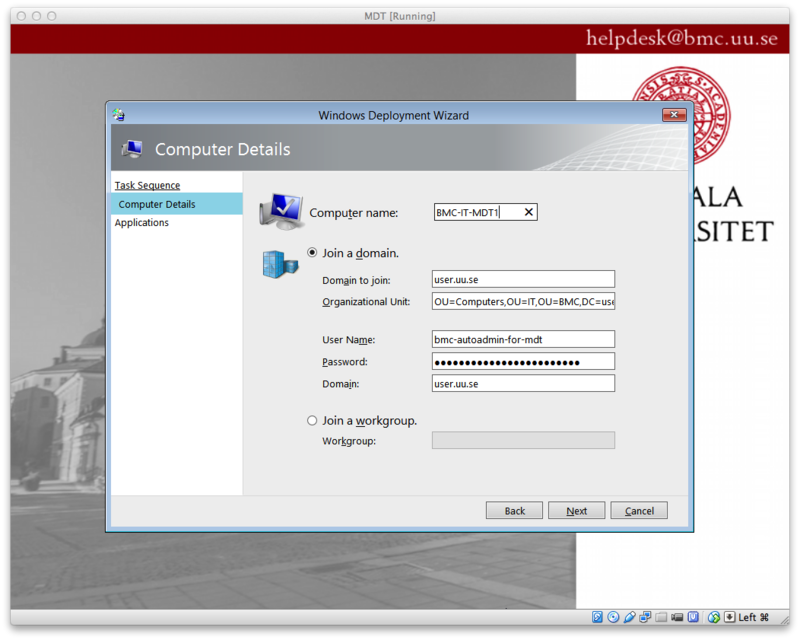 USER\bmc-autoadmin-for-mdt must be given privileges to create new computer accounts in the USER-AD. If you are using a Virtual Machine then name the computer TLA - VM USERNAME. For me at BMC withe the username jny25782 I would name my first virtual machine BMC-VMJNY25782. Wait up to two hours, but normally 20-30 minutes while the computer is running MDT for installing OS and applications. For computers in USER-AD at BMC the local administrator password is set by a GPO to a unique hash for each computer. Any locally set password will be overwritten. Without the GPO SetLocalPassAsMD5 the password will be set to bytgenast which means that you are responsible to CHANGE PASSWORD when the installation is done. Currently the algorithm looks like this: The serial number is upper case, cut to 11 characters, and padded by zeroes until 12 characters length, and then a secret password is added. The following works at the command line at macOS or Linux to create the password.